Qello Concerts is offering a free show every weekend through April 5. This weekend, March 13 - March 15, watch The Doors - No One Here Gets Out Alive: A Tribute to Jim Morrison. Originally released as a home video in 1981 and re-released on VHS and DVD-Video more than 20 years later, the film features key players in Jim Morrison's life, including surviving Doors members Ray Manzarek, Robby Krieger, and John Densmore1. A good amount of performance footage is also included in this one-hour production, along with interviews with Morrison. 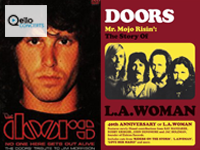 If you want even more of The Doors, the free video March 20 - March 22 is Mr. Mojo Risin': The Story of L.A. Woman. Produced for the 40th anniversary of the release of L.A. Woman, released shortly before Morrison's death, this documentary explores the creation of The Doors last studio album. The film featurs interviews with the three surviving Doors, Ray Manzarek, Robbie Krieger and John Densmore, with contributions from many others who were affiliated with The Doors. Included is Doors footage recorded live and in the studio. To watch these concerts on Roku if you are not already a Qello Concerts subscriber, install the Qello Concerts channel, then select the "No Thanks, Start Browsing" option when you open the channel. Search for or browse to the free concert (this week's is listed under Top Watched) and start watching! Click here for more information on the Qello Concerts channel on Roku, and click here for more of What's on Roku.